All those categories and goals in your budget need money, and that money is in your accounts. Time to add 'em. Start with the main account that holds your money—usually a checking account. Click the Add Account button in the left sidebar. Choose whether to add a Linked or Unlinked account. 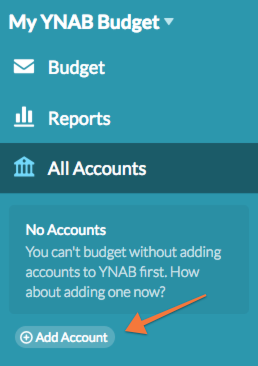 If you choose to link your account in YNAB with your real-world account (you can do this anytime! ), search for your financial institution and follow the prompts. If the card has a balance, create a goal to pay it off! To give you a head start, you have the option to set up a goal or pay off the balance in full! If you choose to pay off your balance over time, you can set a target date or a monthly amount. Either way, YNAB will keep you on track—the Credit Card Payment category will be orange if you need to set more dollars aside for your payment. A category for your credit card payment will be created for you. Why? So you’ll never again wonder what you can afford to pay (yes, that's how awesome you and a budget are going to be together). When you use your credit card to spend money you budgeted, that money will automatically move to your payment category. 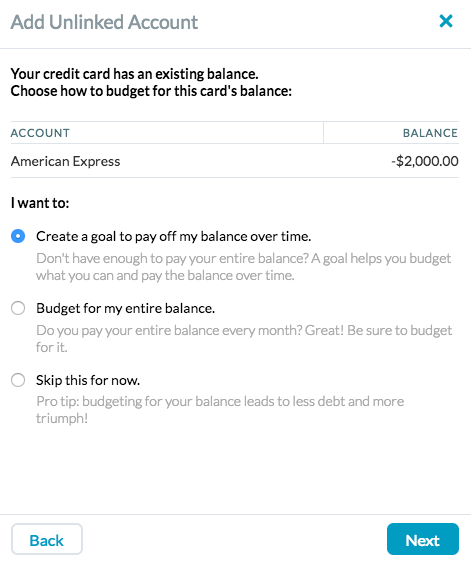 Unlike money that moves to your payment category from purchases, to pay off this starting balance, you’ll budget directly to the category (and budgeting is step 3! ).